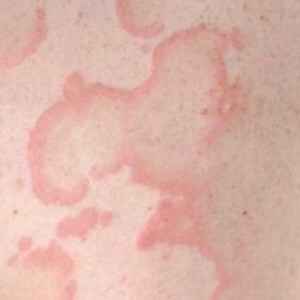 For the past year, I’ve been dealing with hives (also known as Urticaria) dotted throughout my body. There are definitely food items that cause a worse outbreak, but even having a simple home cooked lunch at work consistently causes hive outbreaks only one hour after lunch. Due to a lack of time since I had a full time job and was pursuing a master’s degree part time, I would usually cook a whole set of food Sunday night, and consume it all by Thursday afternoon. Even after graduating, I continued this due to habit. After visiting my doctor, I have discontinued this practice. I initially noticed the hives after work moved the table tennis tables from an old break room to an old Shipping and Receiving type building. First thing I noticed that there was always dust from the ground, but I ignored it. I used to eat (my pre-made meals) on tables in the room, but I’m fairly certain dust was kicked into the air from active playing. By the time I headed back to my office, I would have hives over my arms and hands. I have also stopped playing table tennis during lunch hours. Work also rebuilding a couple of older buildings (complete teardown), and to get to the building, I’d have to walk past the constructions. Who knows what kind of dust and containment are in the air from construction. Since I stopped playing table tennis, I also stopped walking past the construction. I am not a doctor, but have visited my doctor a few times. The few times, I’ve been prescribed antihistamines and various “bandaid” solution that work for the short term. At one point, I was only three different over-the-counter antihistamines at the same time, 5 pills a day. It helped and the hives seemed better controlled, so I’ve discontinued taking the antihistamines to only when necessary, which is not often. Soak in a bathtub of lukewarm water (no added soaps or salts) for 30 minutes, then immediately apply non-comedogenic lotion all over. The idea was to keep the skin from drying out. This was also pretty relaxing, though I wish I had a bigger bath tub. Also, quite a waste of water. I called this a “bandaid” solution because things were good while I was soaking, but it didn’t solve the root problem. To this day, I still get the occasional hive bumps, but it wasn’t nearly as bad as before. I’m still restricting the food I eat and have slightly changed my lifestyle, but my hope is that one day, it will completely disappear.